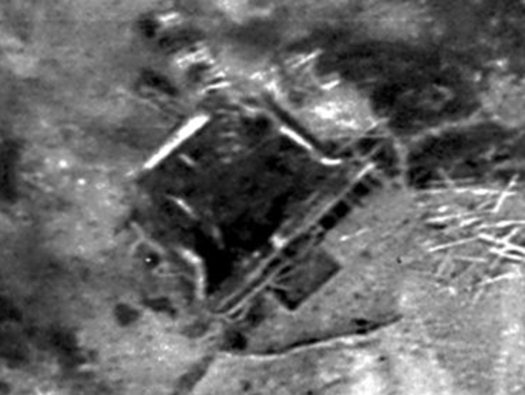 Wn70 Hamel-au-Pétre, K.V.U. 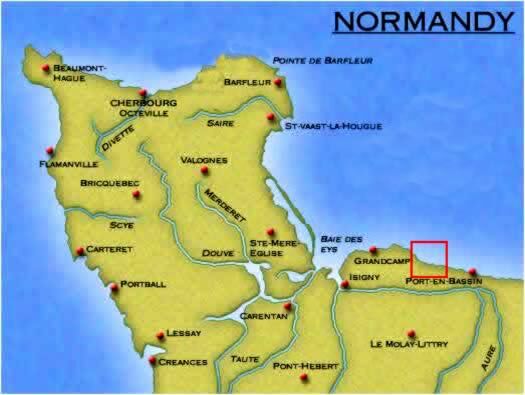 Gruppe Percee, Normandie. 2 x 7.5cm Field Kannon. 1 x 2.0cm Flak gun. 1 x R612 (under construction). Plan of Wn70 showing the trench system with the many machine guns covering the beach with 2 x 5cm mortars which could fire a large amount of mortar shells over the beach area and would have rained down on the landing craft and infantry in and around the water. Then there was either one or two (however you read the history) 7.5cm Field Kanons, one in an open emplacement and the other in a casemate that had almost been completed. 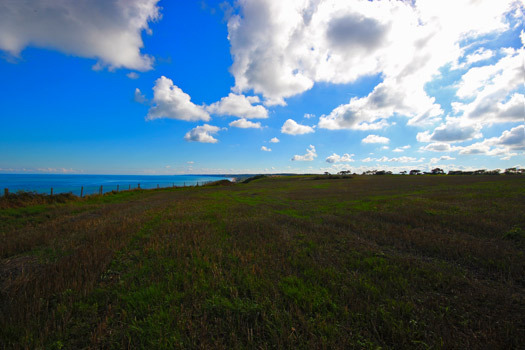 This is the view from inland towards the sea and is the way to walk to the Wn, as its not very accessible from the beach road as most of the land is private. 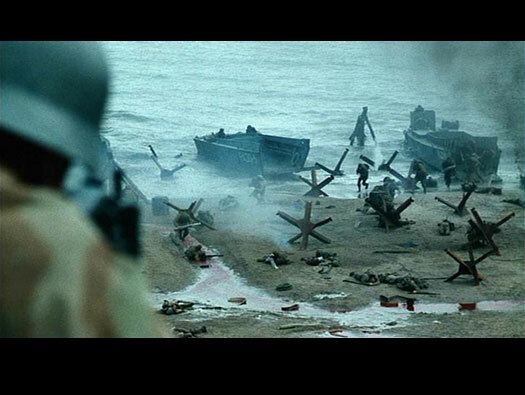 How it may have looked on D-day. Wn70 Hamel-au-Pétre up on the cliff (Bluff). Between Wn68 Les Moulins and Wn70 Hamel-au-Pétre. The view from Wn 70 east along the cliff, there was a trench system almost connecting Wn70 to Wn68 and a few machine guns were noted on the Bigot map. The Bigot map was a map drawn with all forms of intelligence gleaned from occupied France and if you were a trusted member of the allied side you were then called a 'Bigot' , meaning you were safe. Part of a Bigot map. This is how the trenches would have looked up on the Bluff after capture. This is the eastern side of the Wn with a trench cutting under the new wire fence the casemate should have been about 60 to 100 meters beyond.. This position with its gun base and a trench running around the back. There ares many works written about how many guns were here at Wn70, some say one 7.5cm Field Kannon and others say two? It is odd that there are two of these circular emplacements. So why would they not have been filled with their guns? or one was used for the 2cm Flak? 7.5cm Field Kannon in a field position like the one above. The R612 from above and showing that the roof was not finished and tree branches were used as camouflage. After capture and looks as though the roof has not been completed and branches have been used to cover the roof as camouflage. Another icture of the rear door and you can see damage done to its back wall. 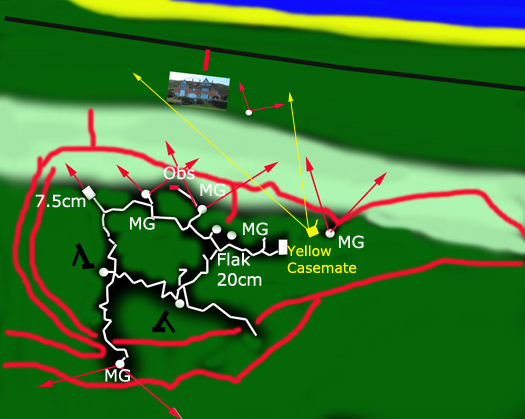 The layout of the defence with a Tobruk covering the rear, two 5cm mortars, the 7.5cm kannon , the R612 casemate and a 2cm Flak. A piece of concrete remaining?? The view down onto the beach at high tide. The house below Villa Hardelay was the house of the Mayor of the village and was commandeered as company HQ of the local defence unit until its roof timbers were needed and used to build bunkers and trenches in and around the area. The tiles were stacked up and the Americans used them after D-day. (What for I have no idea) and a request to have them back some time after D-day and they were returned. The house now is a holiday home and can be rented. 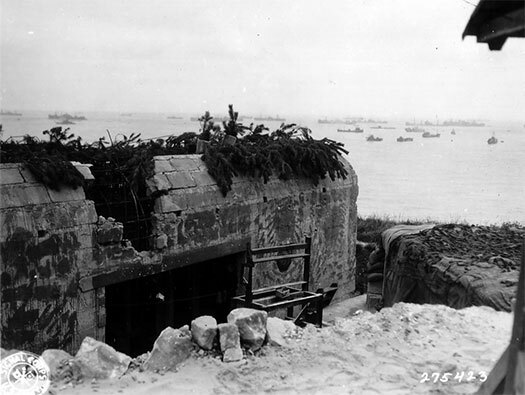 One of the casemates of Wn70 on the bluff. 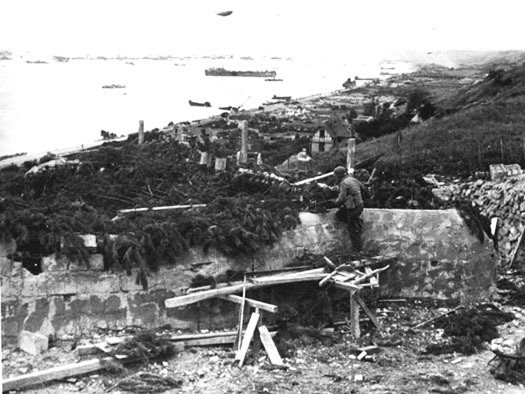 Dismantled houses along the beach front and follow up troops riving. Photographed from below with Wn70 above on the bluff. This looks like a Tobruk for a tank turret. To the right of the house may have been a small command post, an air-raid shelter or just a small bunker of some type. 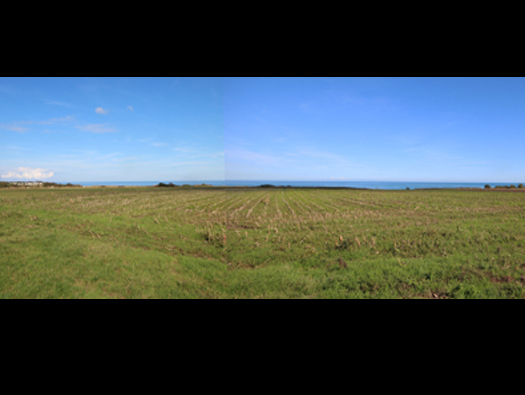 This is the view that several American infantry would have seen. 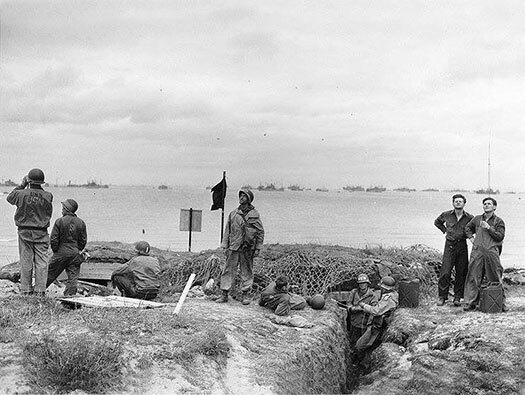 The Americans working their way forward at Easy Red Beach. Dog Green Beach, Omaha Beach Saving Private Ryan. Wn70 seems to have been used by the makers of Saving Private Ryan. 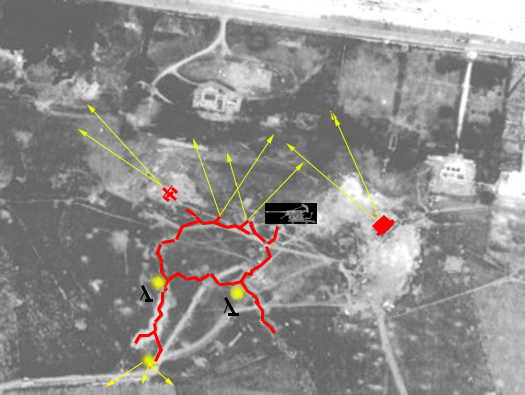 If you see the machine gunner, he is too close to the landing troops and in the film there were many large concrete bunkers but as we have seen here, there was only one concrete bunker, the rest were all trenches. The layout of this section of Omaha Beach. 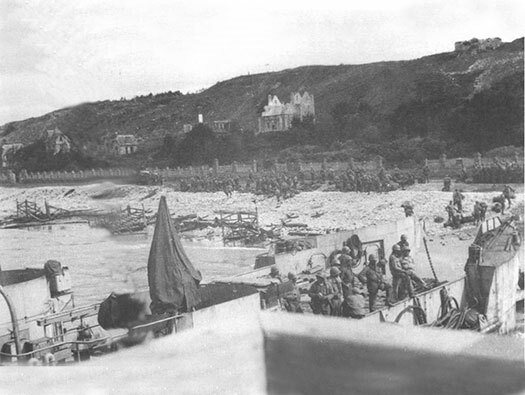 The attack should have landed men almost equally along the coast but due to the tidal flow running West to East pushing the overloaded landing craft to the east, also bunching happened and craft tried to keep together. The main attack happened between Wn73 to Wn71 with devastating results. 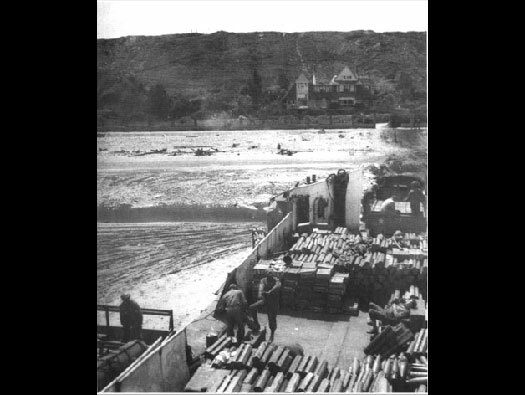 Under Wn70 again a very hard time, but due to burning hillside the Rangers came in between Wn70 and Wn68 and the smoke covered their landing, they managed with the infantry to advance through a mine field and up the cliff and came around the back to St Laurent. 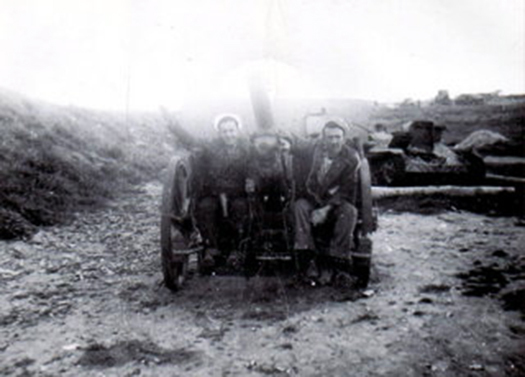 Wn70 was mopped up by follow on forces when they landed and would have attacked from east & west along the cliff top or the defenders gradually retreated as they ran out of ammunition and the loss of comrades as their ranks thinned. How Wn70 may have looked after its capture. Sailors playing the fool on a 7.5cm Field Kannon. Visiting sailors wanted a snap to send home to their families.